December to February have been rather busy, since I have moved my office from Harley Street to the Spire Roding Hospital as well as taken over the care of patients previously under the care of my Consultant colleague Mr. Hamish Towler. Hamish decided to retire relatively early at a time his practice was still busy and I wish him lots of good luck with his retirement in Inverness. I am very fortunate indeed that Bal Sura, who had previously worked with Hamish for 16 years, has taken over the running of my practice and admittedly she does much of the hard work! Since so many of my Optometrists colleagues have invested in an Optical Coherence Tomography (OCT) instrument, I would like to dedicate today’s newsletter to the management of vitreomacular traction. This is a clinical diagnosis, confirmed using OCT, but one that we do not necessarily always need to manage surgically. As always, I am very keen to hear your views of what you would like to hear from me, so please do email me or write to me. Spire Roding Hospital, Roding Lane South, Ilford. IG4 5PZ. 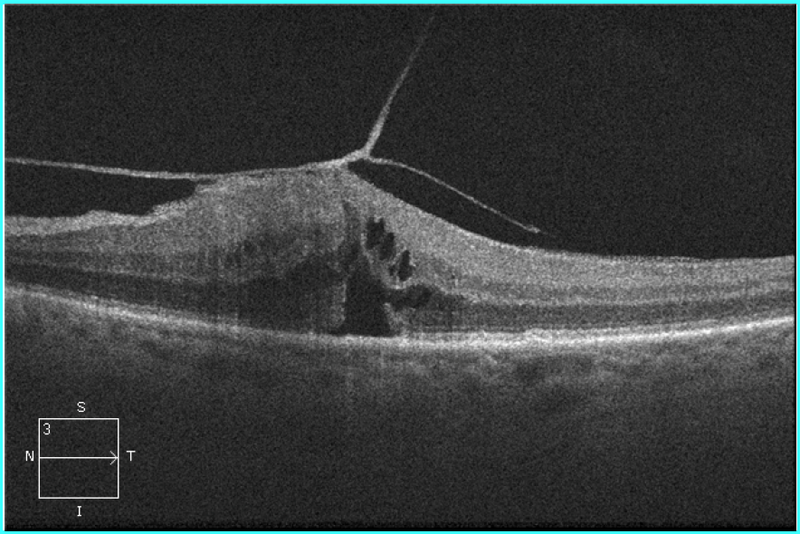 Vitreomacular traction (VMT) is a clinical diagnosis that is almost always supported by Optical Coherence Tomography (OCT) imaging (figure 1). There are very few reports of the natural history of VMT making it hard for clinicians and patients to determine the risks and benefits of the treatment options. Furthermore, there are no large randomised controlled trials of pars plana vitrectomy (PPV) surgery for VMT. A recent meta-analysis of PPV for VMT revealed that only one third of eyes gained two or more Snellen lines. Equally, observation may have disadvantages, with some evidence that only small proportion of eyes resolve spontaneously and in this natural history study 64% of eyes lost at least two Snellen lines over 5 years. Spontaneous resolution may be more frequent in eyes without coexisting epiretinal membranes and in eyes with small areas of adhesion, but conversely VMT can progress to macular hole. What is my favourite management option: Observation! In the majority of patients, I would recommend observation, because many patients with VMT have mild VMT, and usually reasonably good vision and the majority have good vision in the fellow eye. If the vision deteriorates and the patient is symptomatic, I would then discuss the option of PPV surgery or Ocriplasmin (Jetrea) injections. Ocriplasmin is a truncated form of human plasmin, it induces vitreous liquefaction and separation at the vitreoretinal interface. The main advantage of PPV surgery is that the risks and benefits of surgery are reasonably well understood, and based on fairly significant advances in surgery, the risks are relatively small. In the case of Ocriplasmin, there are some unknown factors such as the concern about the risk of unexplained vision loss after injections, which has been associated with abnormalities on the electro-retinogram (ERG). Furthermore, Ocriplasmin has had a relatively poor press at the British Vitreoretinal Meeting a couple of years ago (BEAVRS), because of the reported higher than expected side effects including retinal tears and detachments. 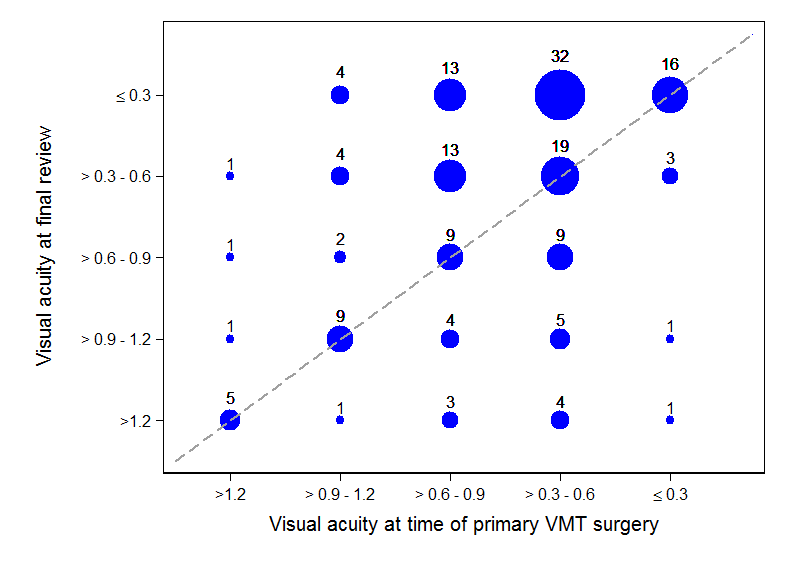 Good patient selection for Ocriplasmin is absolutely essential; only patients with focal small adhesion and no epiretinal membrane would benefit, but the rate of VMT release is only about 50% at best despite good case selection. For patients who have already developed a macular hole, small holes close in approximately 50% of cases at best, but this is still nowhere near the 98% closure rate that can be achieved with PPV surgery. We have looked at a large cohort of cases with VMT using a Medisoft database study which I presented at BEAVRS 2 years ago. Of those that were managed with observation only, we found a median visual acuity of 0.3 LogMAR (6/12) at diagnosis, which remained the same at last follow up with a median follow up of 11 months. 29 eyes improved spontaneously by 0.3 LogMAR units (2 Snellen lines). Of 160 cases that underwent PPV surgery for VMT, 71 (44%) improved, 58 (36%) remained in the same category, and 32 (20%) deteriorated. The general trend for greatest VA improvement was for the eyes with preoperative VA in the middle of the LogMAR scale. The figure below shows the change in LogMAR visual acuity from baseline to final follow up, for those eyes undergoing PPV for VMT. Eyes were grouped into categories to facilitate graphical representation of the data, where the size of each circle is proportional to the number of patients in that category. Those above the dashed line of identity demonstrated an improvement in vision by at least one category. For those of you have OCT scans, when you identify patients with VMT (sometimes associated with other conditions such as diabetic macular oedema or macular degeneration), I would be delighted to review the patients so that treatment options can be discussed. If a macular hole is present, an intervention is almost always necessary. Lovely spring news, good luck. Are you on linked in?